It is not for snow, it is for removing ice from runway in cases when chemical solution is not possible to use because it is very cold. That idea ain’t nw at all. The Royal Netherlands Air Force (RNLAF) ha build some in the late 1950’s early 1960’s already. Probably the Russians stole the idea from the RNLAF and used it for their own airfields. 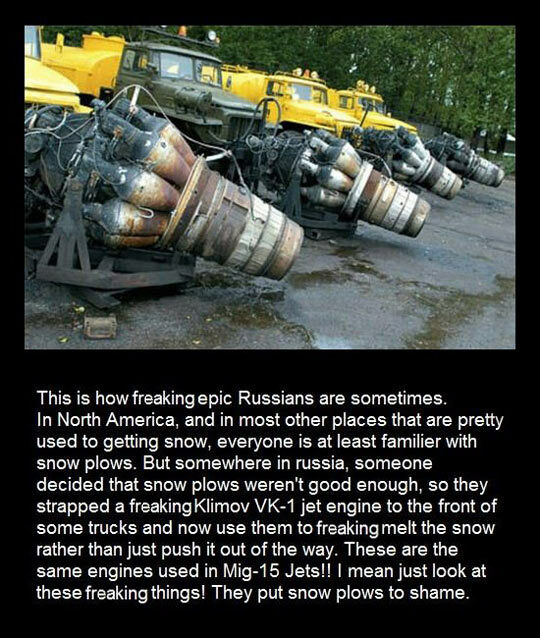 Such VK-1 engine equipped vehicles were used in Soviet Union as early as in the 50s so it’s really stupid to say about stealing anything from RNLAF. I can just see those going along the street. They’d be melting cars as well as snow.